There's a "Recording of Sky Blue" booklet that comes with the limited edition (free for those who preordered, a bit more coin for the stragglers). This is my first look at it. It is beautifully designed, with 40 pages of behind-the-scenes recording session photos taken by David Korchin and, ah, yrs trly. I can't tell you how pleased I am to have contributed in some small way to this amazing album. Dude! 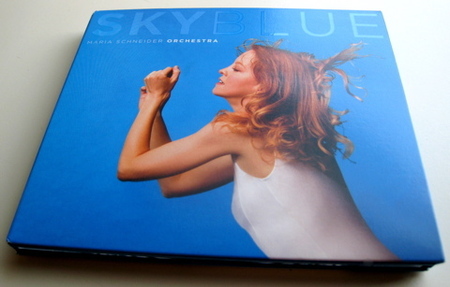 My name is in the credits for a frickin' Maria Schneider record! Thank you. As you were. You *should* be proud to be a part of Sky Blue. It's beautiful and rich from concept to completion (even the packaging is lovely). It is, typically, a hell of an achievement. My employer is presenting Maria and orchestra this season, so my motives are certainly open to question. But my enthusiasm for her work and this recording are genuine. So as a consumer and music lover I thank you for your work on Sky Blue. I got mine in the mail yesterday and was so pleased to see your photos in the second booklet! What a great experience it was to be at that recording. That is wonderful you have your name in the credits, and I was happy to see my name listed in the thank you's! what exactly is she doing in the cover pic? just curious. It's kinda wierd. Have you ever seen her conduct? That's a total Maria gesture -- although I can see that it might look a bit contrived, if you hadn't seen her do it a million times in front of her band.